Refreshments, & what kinds of refreshments? Training workshops for young people? This is the secret room above the ticket hall, brought back into life by a local community initiative funded by small grants, 2008 – 2011, from the Community Council CGS programme. The Community Council applauded at their 8th December 2010 meeting the latest reports and pictures, and started the discussion about suitable commercial uses to make the best of the wonderful space. Further funds are being sought to continue the restoration to the external staircase, & to improve the station walkways. This would be the public entrance to the space and make it useable for public activities. Local residents are developing a social enterprise project to bid for the lease from Network Rail for a multi purpose flexible venue. 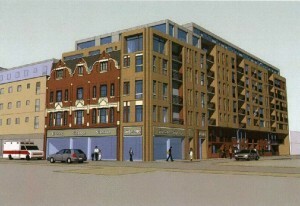 For more information, see brief here, and blog here http://peckhamresidents.wordpress.com and . From Cityness blog – What Makes the Urban Tick? Old Waiting Room – restoration. It is an understatement to say that quite a few urban planners and architects would like to keep local communities at bay during the process of developing the urban. Main reasons? Fear of NIMBY-behavior, fear of delays, fear of less-than-progressive ideas about what should be done and, in some cases, fear of people who are not part of the cozy inner-circle of architects, planners and designers. … Sometimes a dialogue of the deaf is the only result. … The Peckham Vision (UK) is an example where things went differently but with favorable results, as even architects in the Architects’ Journal acknowledge. Peckham Vision is a communal gathering in order to generate new ideas about the future of the Peckham town centre and its buildings. Read more at cityness.wordpress.com. 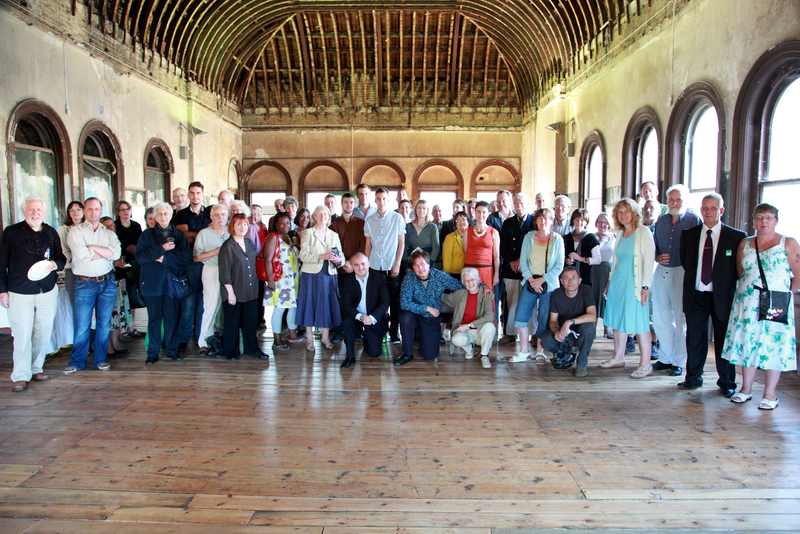 The Peckham Society and Southwark Council recently celebrated the beginning of the restoration of the Grand Waiting Room at Peckham Rye Station. Peckham Rye’s handsome Victorian station has been struggling to be seen since buildings were thrown up in the square in front of it in the 1930s. Stand and look at the station now, and you will see two extruding blocks, one on each side of the main entrance. The one on the south side contains a stone and iron spiral staircase, the timbers of its floors rotten, the plaster walls crumbling in chunks, and an arrow pointing upwards, graffitied in black, with the words “To the Billiard Hall”. The billiard hall operated here for 60 years until it closed in 1960, after which all was silence. Secret hall beyond Platform 3 holds key to Peckham’s future? A waiting room left hidden on platform three of Rye Lane Station could be the key to unlocking future investment in Peckham. Like something out of J.K. Rowling’s Harry Potter, this enormous space opened as a waiting room in 1865 and was turned into a billiards hall in 1890 until it closed in 1960. Forgotten, over the years this space was left to fall into disrepair. It has only recently been opened to the public (albeit briefly), but for those wanting to attract future investment into Peckham town centre the space represents a way forward. For over a decade the planners and officers at the council’s regeneration department have toyed with a multitude of ideas on how to improve Peckham as commercial hub. In 2001 radical proposals to transform Peckham into ‘the Notting Hill’ of south London were being considered by Southwark Council’s Peckham Partnership. The head of this regeneration body, Russell Profitt, was looking at recommendations which would mean knocking down huge parts of the high street, pedestrianising large parts of Rye Lane, demolishing the dank and dark buildings around Peckham Rye train station and expanding the Aylesham shopping centre. Years before in the 1990s, Peckham had undergone a huge regeneration programme, when £64 million (and £150 million in other funding) was given to the area, predominantly to transform housing in the north. As well as removing the notorious estates, some of the legacy from that money was the new Peckham Square and the iconic library within its boundaries. Last year the council officers were back on the hunt for a way forward, producing a document entitled ‘Future Peckham’ in a bid to garner people’s opinions on what they wanted to see. This hefty 54 page document again suggested a myriad of radical changes in the area, including relocation of the cinema, the creation of three fifteen storey buildings for new homes and once more the redevelopment of the Aylesham centre and Rye Lane to produce a vibrant shopping environment. But since the initial proposals from Russell Profitt for a ‘Notting Hill’ of the south much has changed on the ground in Peckham. Mr Profitt left the renamed Peckham Programme in 2008 and the subsequent abolition of a town centre management has left a vacuum in the council’s daily coordination on the ground. 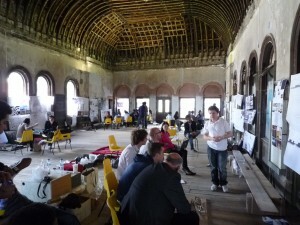 Over 40 students from the 2nd year Canterbury School of Architecture came to Peckham on 28th May 2010 to show their designs for the area around the Peckham Rye Station. They met in the Old Waiting Room at the station. For the last two years the school’s spring term design studio has focussed on Peckham’s town centre, in particular the open spaces in front of and behind the station. Many of the students come from south London. 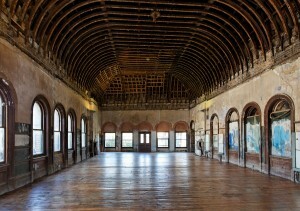 The event was held at the enormous former waiting room at the Peckham Rye Station, which has been unused for more than forty years. 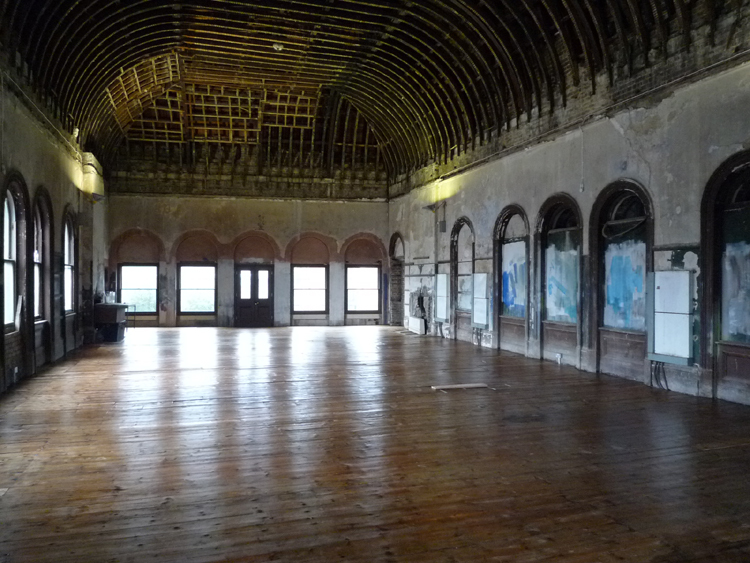 This remarkable, grand, space is one of the highlights of Peckham’s architecture and is being restored by the local architect Benedict O’Looney, with the help of Southwark Council. Benedict is a conservationist active with the Peckham Society and a design and history teacher at the Canterbury School of Architecture. Southwark Council’s community-oriented ‘Cleaner Greener and Safer’ fund has put forward several grants to unblock the windows and restore the floor to the former waiting room, which was used as a billiard hall from the 1890s to 1960. This room was bricked up and closed off to public use when the station’s southern platforms were rearranged in 1962. The Peckham Rye Station was designed by the eminent Victorian architect Charles Henry Driver in 1865, and this large and lofty waiting room was the building’s principal interior space. The Peckham Society has been campaigning forthe restoration of this prominent local landmark and was successful in getting the station listed grade 2 in 2008. It is hoped that the former waiting room will one soon find a new life as a community meeting space, gallery or cafe. 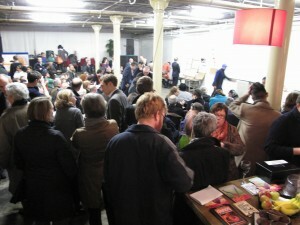 The large student gathering made clear the space’s excellent community potential. Latest news 6th March: Planning permission refused. See decision here. See planning report here. Meeting Thursday 18th March 2pm at CLF Art Cafe, Bussey buildng, 133 Rye Lane, SE15 to seek better planning from the developers and owners of the land on the Copeland Cultural Quarter site (see here for more). 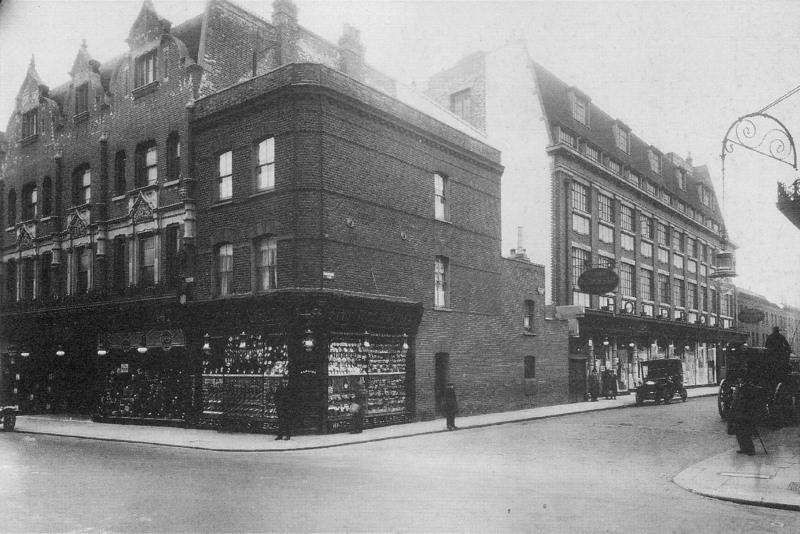 January 2010 – Developers sought permission to demolish what remains of the historic Holdron’s on the corner of Rye Lane / Bournemouth Road. It looks potentially as inappropriate and poor quality in design as the Wandle housing block next door to it. Also its design with cramped flats might exacerbate the social problems already experienced from the Wandle block after only two years. It is not integrated at all in the thinking of the developments that can happen now on all that big site behind, now that the tram depot threat is fully lifted. For those not up to date on this – TfL consultants finally a year ago reported that that site was completely wrong on all counts for the tram depot and another different and appropriate site was found. This news got completely lost in the news of the tram project itself being suspended. This was a shame as it fully vindicated everything Peckham Vision had said including that it would be bad for the tram itself if the tram depot location plan was not thoroughly re-examined ASAP. Once TfL did review it, they conceded everything Peckham Vision had said about why it was a defective decision. In spite of the blight caused by the TfL plan to locate the tram depot here, organic developments have continued in the Copeland Industrial Park, resulting in the growth of important cultural and small business enterprises. These have demonstrated the significant potential for this part of Peckham Town centre in the life of the town centre as a whole. In response to the Issues and Options report, Peckham Vision asked that the Preferred Option Plan should include an overall framework plan for the part of site 71P which lies between Copeland Road, Bournemouth Road and Rye Lane, including the applicant’s site which is an integral part of it. We submitted an indication of the outline of such a framework. This indicates that considerable progress has already been made in developing such an approach. Peckham Vision believes that this needs to be completed as soon as possible to provide the right planning context for a redesigned development on the applicant’s site. 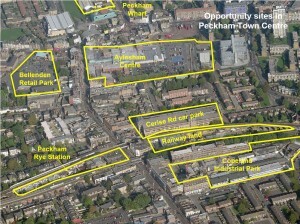 We know that two major objectors to the current application – The Peckham Society and Peckham Business Park – both of whom are members of the Peckham Vision Consortium, are very ready to cooperate in the development of such an overall plan with the owners of this applicant site, and in liaison with the Council as appropriate both in terms of meeting the objections to the current application and also contributing to the development of an overall framework plan for site 71P in the PNAAP Preferred Options report. 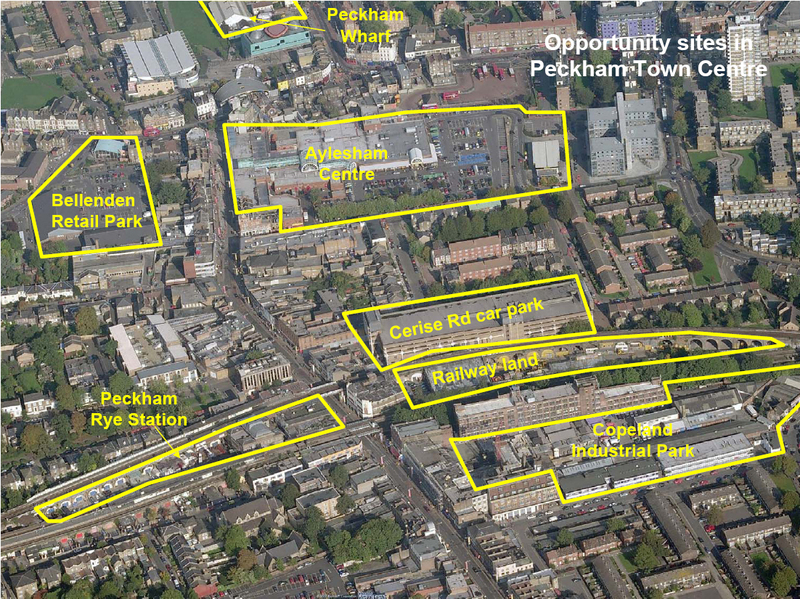 Peckham Vision has therefore asked the Council to encourage the applicant to withdraw the current application and to work with the other property owners and occupiers on the adjacent sites, and to liaise with the Council on its work on the PNAAP. This would enable a redesigned proposal which meets the Council’s UDP criteria for developments in Peckham and enables this site to fit within the overall plans which are emerging for this important part of the town centre and Rye Lane. See Peckham Vision letter here. Failing that we have asked the Council to defer consideration of, or refuse permission for, the current application to enable this discussion and collaboration to take place. See other objection letters here, from The Peckham Society, and the Peckham Business Park. See all the details on the Council’s website. Design and access statement – 1 OF 2 2009-11-25: There are 38 pages of pictures and diagrams of what the buildings will look like as well as details of design and access provisions, and of the site now. Planning statement (1) 2009-11-25: This covers their case for how it meets all the Council’s criteria and requirements. First 21 pages are the key ones. Last weekend, taking advantage of the bright, crisp December weather, I wandered around my south London neighbourhood of Peckham with an architect friend. We were talking about how tough the year had been for the construction industry. ‘Soul-destroying’, said my friend, as we drifted from bustling Rye Lane into a post-industrial no-man’s-land. Within minutes however, we caught sight of Walter Menteth Architects’ supported housing scheme on Consort Road, and our gloomy discussion stopped. Given the immediate context – a railway viaduct behind, with arches beneath, bus depot and materials yard opposite and a busy A-road running along its length – its visual purity proved shocking, unexpected and genuinely thrilling. Let me explain. The project has a bold sculptural form, comprised of three distinct blocks. A six-storey shared ownership scheme links with a terrace and a corner block of rented flats. The elevations are white render, they incorporate glazed winter gardens and magically, at street level, they sparkle. The architect has laid vertical slabs of Tarmac, embedded with glistening aggregate, to break up the elevational strip. Stainless steel panels on the north end, which comes to a point, soar above these slabs. It looks amazing. The rear elevation is just as good, perhaps better. It deals with an access road (serving the arches) by sectioning off its footprint with a perimeter wall of concrete and gabion cages. It feels – and is – robust. Beyond, an elegant curving glass wall, beautifully modulated with strips of galvanised steel, provides a buffer zone between the flats and railway. We spent time examining the building, which was completed just over two years ago. It was one of those moments when you feel good about architecture. About how compassion and craft can combine to transform the mundane, make a place out of nothing, and bring light to the darkest of environments. It reminded me how hard the architectural profession works, throughout the UK, to steadily and incrementally improve our nation’s lot, and continues to do so, even when times are as tough as they have been lately. All the best for Christmas and the New Year. You deserve it.